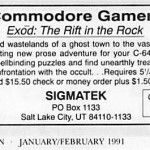 Exod is a text adventure game by Sigmatek, and was advertised in RUN magazine in the US, where you have to explore ruined wastelands of a ghost town to the vast inner caverns of earth. The game was sold on disk, but it seems that this is one that either didn’t sell that well or never got fully released. Another game was also mentioned as coming soon called "Wolfgrounds" which also seems to be missing. At present nothing of the game seems to have been preserved, so we are not sure if this is game that never got fully released or if it is just not backed up yet.